Karbach, a brewery just a few hours away up Interstate 10 in Houston, TX, yet we do not receive their beers here in San Antonio. I had to be in Dallas to buy me some of their beers. On my annual trip to Dallas for the Texas Frightmare Weekend, I also have a must stop location called Lone Star Beverages in Carrollton. They are strictly a Beer & Wine store, open 7 days a week, and for the past 8 years, they have been focusing on craft beer from around the US, and pushing the Texas breweries to the public. I do plan on doing a write up feature on this store, so stay tuned on that. One thing I love about this store is that they have a great selection of beers available for single bottle/can purchases instead of having to buy the whole four or six pack. For an avid craft beer drinker like myself, this works out in my favor as I get more variety this way. I have had one other Karbach beer before, Hopadillo IPA, when a friend from Houston visited San Antonio a while back, and he had some to share. I was really looking forward to trying another one of their beers, as I really enjoyed the first one I had. After a day at the Texas Frightmare festival, we ventured upstairs to our hotel room, and popped open a few beers, which meant I was right back to work for BeerMetalDude.com. I’m always working, even on vacation, dammit! Using my newly purchased Texas Frightmare pint glass, this beer poured a bright golden orange color with a thin white head with good retention and nice soapy lacing. Good carbonation bubbles. This had a very impressive look, and as I was snapping the photos of it, I found myself salivating in anticipation to drink this beer. Saisons are one of my favorite styles of beer. For me the body of the aroma and on the back end is mostly spices and light citrus fruits. I can smell the sweet and tanginess of the grapefruit and orange peel, especially in the aftertaste. They are a bit on the strong end, but for someone like me, I think that is a good thing. I like a lot of flavor. There is a spicy smell to it as well, and a bit of a banana note. I can also pick up a bit of the wheat used as well. Taste is in the same alley as the aroma. I can pick up the wheat, banana notes, spices in the body, and a nice crisp aftertaste of citrus. The lingering aftertaste reminds me if I just ate a grapefruit. Very refreshing on the palate. The mouthfeel is crisp and spicy as this beer has good high carbonation, and wrapped with the flavors, it just leaves the right amount of bite. The body is also not too heavy, making this beer easy to drink. I wish I would have enjoyed this beer on a hot summer day at the beach or outside in the yard instead of my hotel room. Nonetheless, this beer was quite enjoyable. As I said before, Saisons are one of my favorite styles of beer. 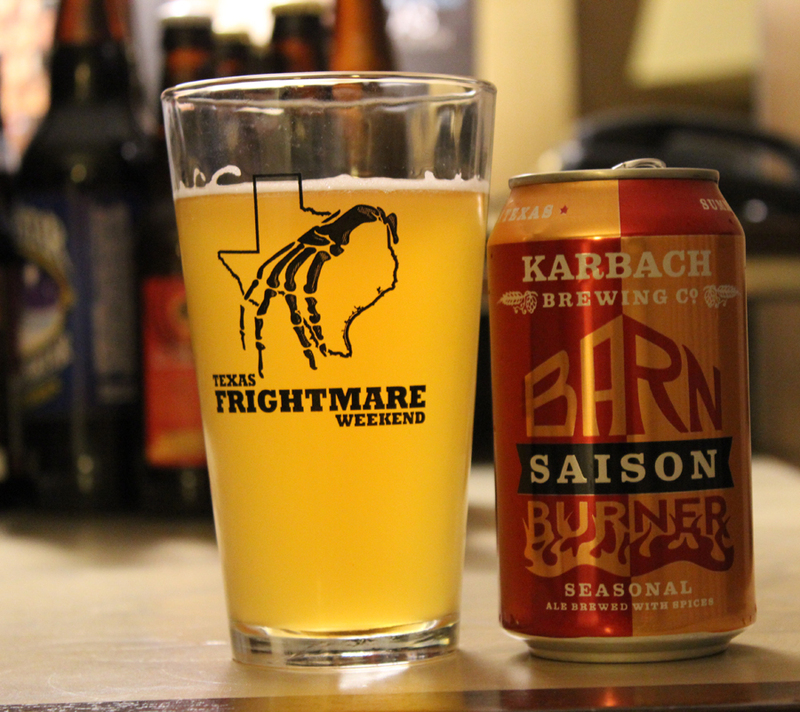 I have enjoyed all to most of the Saisons I have tasted, and Karbach did not disappoint me. This beer looked amazing, and had tons of flavors and aromas going on. If you can get your hands on this beer, please do so. It is a seasonal beer for Karbach and is available between March – May. Since Karbach is coming from Houston, TX, I thought what better way to represent the Metal Connection than with a Houston based band. Infernal Dominion are friends of mine, and were punishing people from 1999 to around 2005 with their brand of Satanic Death Metal. Recently the band has reformed and are ready to crush skulls once again. For now, I leave you with my favorite track off their one full length album, Salvation through Infinite Suffering. The song is called “Gutted Children of Faith.” Enjoy! Gutted in the Barn, BeerMetalDude!